We are basically fulltime RVers, traveling 7 months a year. The last 8 years we've traveled in a 16 foot fiberglass Scamp trailer. Previously we had traveled in a Ford chassis, Bounder motorhome. The Bounder had been owned by a Ford mechanic, surprisingly the Born Free was also owned by a Ford Mechanic. Though the rig is old, it only traveled 70,000 miles. We are flying up this week to pick it up. As it turns out there was a visitor in our Escapee park this week with a Born Free and had a tour of his rig. The real wood interior reminded of the oak in our Bounder. I am seeking suggestions on any specific areas of inspection in term of experienced failure points, also common modifications of value. We have 5 months before we hit the road for an 8 month trip West beginning this coming March. We presently own a Honda Odyssey for towing our Scamp, a really great tow vehicle for older couples like us. We used to flat tow a Honda CRV behind our Bounder. What do you tow? Any modern suggestions? First, welcome to the Forum and Born Free ownership!!! It sounds like you've gotten quite a find! I had an '01 23' Rear Kitchen on an e450 chassis and now have an '06 32' rear queen on the Chevy Kodiak 5500 chassis. I've had five Scamps myself over the years... two 16', two 13' and a 19' "fifth wheel." I also currently have a Coachmen 190RD 19' B-van on a '95 e250 chassis. I had a '94 Airstream B-190 19' on the e350 chassis with the same drivetrain you'll have in the Born Free on the e350 chassis. Your '93 will have the 460 with an E4OD transmission. The drivetrain generically is pretty bullet-proof, although each has some areas that could be problematic. The 460s tend to run hot if the radiator has any corrosion in it at all, and it would be a very odd unit indeed that didn't have corrosion in the radiator after twenty-five years. When I bought my '95 Coachmen, I had ALL of the fluids changed everywhere, and new brake lines installed. The only real issue with the Born Free coach itself that I can direct you to look at is the seal around the front window in the cab over if it has one. If it needs to be sealed, DO NOT use a silicone caulk. Not only will a silicone product not seal it permanently, but nothing else will adhere to the surfaces after you've used it and removed it. There are a number of threads here about sealing those windows. Otherwise, if it's been well-maintained, it should just be a matter of driving it and having a ball!!! On towing... probably the easiest vehicle out there to flat-tow is a Jeep Wrangler, and they can be found already set up for towing with some regularity. I bought mine new and had to have it outfitted, but it was worth every penny. Feel free to ask any specific questions you may have... undoubtedly someone here should be able to answer them for you! Just a side note. We Born Free owners are so proud of our units that we prefer to call them motorcoaches - not rigs! Enjoy your Born Free motorcoach. Or instead of rig or motorcoach you can call it a Kumquat. Sorry if I offended anyone with the term rig. I'm a pretty serious RV traveler. We retired early to become RVers, though we had never owned or traveled in an RV. Our first RV was a Bounder on a Ford Chassis with the same Ford 460, same solid oak cabinetry. It's now been 18 years since we started our travels, spending some 4000 plus days camping and on the road. We view our travels as a great part of our life and feel blessed to have traveled together for so long. We love our Scamp and we are sure we'll cry when we give up our Scamp, even though a grandson wants it. Our first Born Free trip will be from Maine to our Escapee park in Florida. It will tell us a lot. One of my first projects is adding shelves/or possibly drawers to the bathroom closet. Presently it looks like a hanging locker. We have no hanging apparel in our present rig. Once we moved from the Bounder to a small trailer we gave up the idea of ironed clothes and accepted the wrinkled look. Even the little we take for dress clothes is folded. As well we do not carry winter coats, choosing layered attire for cold weather. Are there any thoughts or suggestions about this modification? Since you are a seasoned RVer, you know the importance of watching tire age and condition. Manufacturers recommend replacement of tires if older than 5 years from the manufacture date. To me, this is one of the most important inspection areas. We got into our Born Free last night and noticed that the cabinet doors has latches built into the edge of the cabinets. A couple are broken or missing. Does any one have a source for these latches? We have placed our motorhome in the shop for a general inspection and replacement of all fluids before we take off on Monday. Sunday I'll be able to post a picture. Thanks Ben. We are relatively tire conscious. Our 16' Scamp has 13 inch wheels, lots of revolutions per mile. We do use tire pressure/temperature sensors on our trailer, Ginny has responsibility for monitoring the tires. We replace them on a 3 year cycle. On our Motorhome we had Michelins initially but we had 5 Michelin failures and replaced them all with a different brand and have not bought Michelin since. With consideration for the tires (and ourselves), we typically drive early in the day when it's cooler, target 150 miles a day and drive a about 55-60 mph. We are retired, no rush is necessary, and though we have general destinations we rarely make reservations except for busy national parks. We brought the Born Free to the mechanic today and gave specific instructions but also instructions to fix anything he found. without seeking approval. He's a young but successful mechanic and a family friend who has previously worked on this specific Motorhome. We hope to have it returned in two days. I drove the BF today and the 460 sounded familiar and it drove nicely. It's about 2/3rds the size of our previous 460 powered motorhome and less than 60% of the weight. It has virtually the same flexsteel furniture of our previous motorhome, truly comfortable seats. We intend to add a spare for our western trip this spring. We now have a list of about 30 mods to the Born Free and a number of repairs. I think the hardest part will be finding some of the necessary parts. When we get it back from the mechanic we plan to spend the day doing a detailed review of the BF from a usage perspective. This, in a sense, is really our home for at least 7 months. I know it's on the small end of the BF spectrum but for us, coming from the Scamp, it's huge. Besides fixing mostly little things, we'll also be converting space into useful space. One nice aspect of living it Florida is it will be warm enough to work on it outside. What do you tow? Any modern suggestions? I tow a 2013 Smart Car. The car weighs 1800 lbs. I hardly notice it's behind me. Since I don't have any brake assist, it does take a bit more effort to stop. 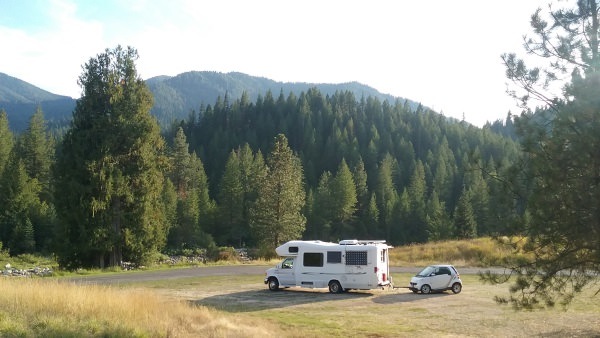 About the only thing that the Smart has going for it is that it tows easily. Starting 2018 only the all electric version is available in the US. Tom, Our son who bought the Born Free for us had an electric Smart Car for 3 years for going back and forth to work. I suspect we will purchase a manual transmission Honda HRV, heavier than your Smart car but it should not be much of a load for our Born Free 21'. With our initial RV, a Ford 460 based Bounder, we towed a Honda CRV that had little effect on MPG on overall driving. We found that most of the driving when we do a loop of the USA is in the tow vehicle, typically a loop of the USA was about 8,000 RV miles, averaging about 30 miles a day. With the Bounder that meant 1,100 gallons over 8 months, the effect of the car was less than 100 gallons. We have also looked at a Kia Soul. It will also depend on whether we decide to keep our 1991 Scamp 16. First Day working on our 1994 Born Free. Saturday we picked up the rig from our families local mechanic. It helped that he had previously worked on this Born Free letting us know he had recently completed a full brake job. The only thing he did not have time to do was repair the blower system though it does work on high. Saturday was a northeaster here, really windy but the BF handled it well. We began the day by going thru every cabinet, seeing what was left behind. Today the GFI failed today. Since there is no way to get an RV breaker on Sunday (and as well I don't like GFI circuits) , I simply wired the GFI circuits into the microwave's breaker until I can get a replacement breaker. It is my intention to replace the GFI with a double breaker so I can add additional circuits, there are never enough outlets. AS well I found the AC panel to be a mess of wires, I plan to re-do that as well. WE also repaired the bathroom door. It would not fully close because it would hit the counter in front of the sink. Something had obviously moved. We did not figure out what had moved but simply haad to move the door about a 1/4" or so left. We tried to inflate the air bags, noticing the tubing looked new. It was not a good replacement job because it leaked. Assuming the bags are good I should be able to fix the air lines. The previous owners had taken out the door side seat, something Ginny likes so we re-installed it. As well we gave tours to a couple of friends and relatives. We also bought a turquoise ,color luckily matching our stripes, bumper box for the odds and ends. Day One, Living in the Born Free. Yesterday we had an unusually long drive from Hebron, CT to Glascow, DE, some 270 miles, almost twice as far as we normally drive. I found myself driving faster than I do when we tow our Scamp, suggesting I was comfortable driving. Once on the NJ Turnpike I put on (tested) cruise control setting it to 57 mph and had a comfortable ride until the end of the turnpike. Once set up we tested the water system, water heater, dump station, toilet. All stuff we bought without testing. Everything worked except the water heater that needs adjustment of the flame, burning a smoky yellow. The bed, jack l\knife couch turned out to be virtually the same width as the Scamp's bed. Most people who own Scamp's continually complain about the Scamp's sleeping facilities but not us. We are happy in a small bed. The previous owners had reupholstered the couch with higher grade, thicker foam and it is more than acceptable. Our biggest concern in the 21' is that lack of good table space, even little end table space. Where do you even put a cup of coffee. It came with two tables, a two person and a four person. Items I suspect we'll never use in their present form. I'm positive the four person will go. This is a chance for some form of creative design. Today a stop at Walmarts to pick up this and that to make it a little more comfortable and a test of the propane heating system. We have bought all kinds of stuff and had it shipped to our FL home. Most of the external plastic is getting sun fatigued. So far we're happy with our Born Free. The guts seem strong. We make a list of things to test each day. Today we ran the Air Conditioner and the Refrigerator on Gas. Both worked well. I also went under the rig to look at expanding the volume of the gray tank. It looks like it could be tripled in volume. I rarely drive any where with full waste tanks so the extra weight will not be a problem. I did notice that none of the tanks are protected. On our trips to Alaska and across Labrador we protected the waste tanks and gas tanks with foam. After the trip the foam was peppered but no damage to the tank. We particularly concentrated on front facing surfaces. We are now preparing to assign cabinets and drawers, there is an amazing number. We plan to shelve the huge bathroom closet and the over cab space. Our biggest issue is creating an end table and eating table solution different from the standard Born Free solution. I happened upon a bumper box solution in Walmarts. It is turquoise, matching the stripes. I also plan to add a plastic pipe with end caps under the body for sewer hoses. One other item is the addition of a method for carrying a spare tire. Ginny is positive that it's a must. Presently it's in the bathroom closet. We'd be happy to read any solutions or ideas. We did spend our first night on our couch. It turned out to be the same width as our Scamp's bed, 44". It was fine though it would be better if the inside and outside sections were the same width. We are working on a solution for the mid bed gap. The gap is more pronounced than normal after the previous owner's reupholstering of the bed. Is your entry door out the back or on the side?